This is the photo that started it all. Prior to the Kangaroo Ragout, this humble photo of my crazy-eyed, hunger-fuelled, put-it-all-in-a-wok experimentation for dinner was posted on F&c^book and someone asked for the "recipe" at work and I didn't really have one. In fact I then commented on the photo with: "Papardelle with (Latina fresh/cheat's) creamy carbonara sauce with shredded butter & lemon burnt chicken, smooshy broccoli, chili, pine nuts, pancetta strips and approx half a block of Parmesan. In a wok." Boil broccoli pieces and pasta (wide long and flat is good eg papardelle, fettucini, linguine or even use lasagne sheets and slice them into extra wide noodley strips) in a big pot of salted water. Meanwhile heat up another pan (or wok) - toast some pine nuts on the surface as it heats up. Then add a generous amount of butter and/or olive oil with lots of lemon juice and dried chilli flakes & cracked pepper. In this mix, brown some chopped up chicken, with optional chopped onion. 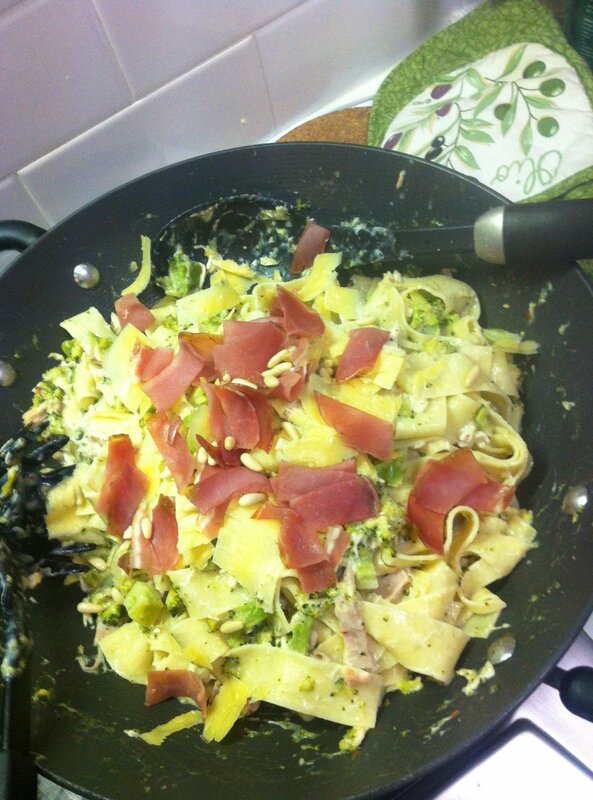 By now the broccoli and pasta should be cooked - drain and add them to the chicken pan. Pour over some store-bought creamy sauce (eg Latina Fresh or jar-fresh) over and mix. Grate or slice over a huge mountain of Parmesan. Top with optional roasted crispy pancetta (or proscuitto) strips. Fresh herbs on top as you wish and hey presto, a substantial almost-one-pot wonder (if you cooked in serial instead of parallel you could just use one pot). For vego just omit the chicken (and pancetta).